Bluewater Creek Farm’s mission is simple: to produce nutrient dense, clean food in a sustainable way. 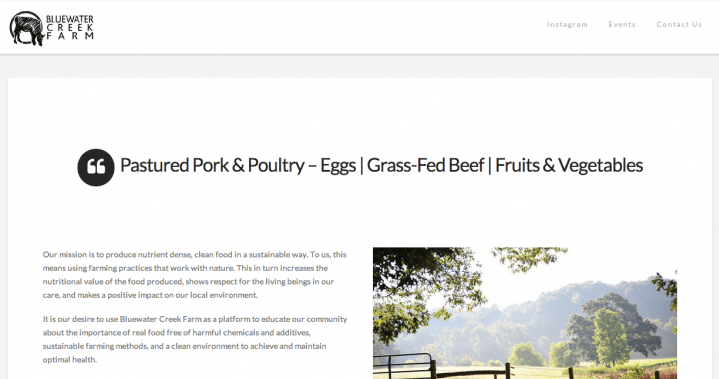 The farm’s owners hired Shoals Works to take an existing domain name and build out an entirely new website using our Pro Plus Package. Social media accounts were professionally linked to their site and the farm’s Google Maps location was converted to a Google Plus account. The G+ account matches the farm’s brand and messaging. As with most farms, change is constant at Bluewater Creek Farm. The owners asked for a simple method to keep customers updated. Shoals Works implemented an Instagram solution that links their account posts taken in the field and barn to their website. Photos and video added on Instagram automatically display on the website. 2019 Update: This business has moved to an industry-specific eCommerce solution.